From time to time Hall of Fame quarterback Troy Aikman gives his thoughts regarding his former team. Since the end of the season he has made a few comments on Tony Romo, however they have been brief and often blown out of proportion. 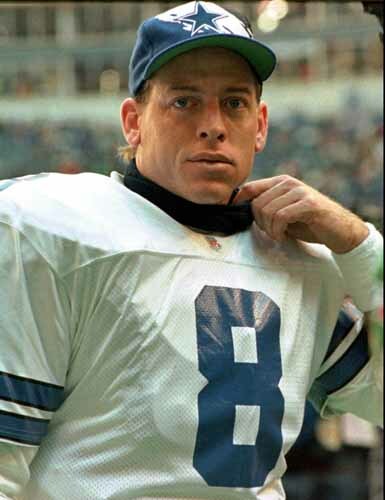 Recently Aikman gave a somewhat lengthy interview where he talked about several items pertaining to the Cowboys. The most interesting of the topics Aikman addressed is his praise of Romo. Aikman came to the much needed defense of Tony Romo at a time when it was absolutely needed. Romo has come under massive criticizm from fans, and analysts alike, since the season ending loss to Philadelphia. Aikman stated that “too much attention is paid to him (Romo) and not the rest of the team” with regards to the lack of success in the postseason. “From what I’ve seen there is a whole lot of good that he is doing out there at that position.” The Hall of Famer even went as far as to say “Tony is a terrific talent, If I was starting a team and Romo was my quarterback, I’d be awfully excited about that.” That’s a pretty strong statement from a guy who won three Superbowls at the same position as Romo. Troy Aikman is always straight forward with his comments, and this is why when he talks, everyone listens. But only time will tell if his beliefs ring true.